Traditionally the months of January and February are dedicated to the Malian music festivals. 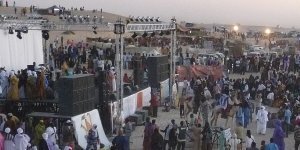 From 12 till 14 January artists enter the stage at the Festival in the Desert, held in the sand dunes near legendary Timbuktu. Besides Malian & international artists there will be a variety of activities, including camel races, at the festival grounds. Extensive information on the program is available at the Festival in the Desert website. From 15 till 19 February Ségou is dedicated to music with its Festival on the Niger. A choice of musicians climbs the floating stage on the river quay. And during the day there’s a variety in cultural activities at and around the festival site, including dance and pirogue races. Information on the program is available at the Festival sur le Niger website. Interested in a beautiful journey around one of the festivals? Besides our Mali Music journeys, we gladly tailor-make a journey, based on your wishes and ideas.